Born Charles Joseph Crist Jr. on the 24th July 1956 in Altoona, Pennsylvania USA, Charlie is a politician, best known to the world as a member of the Democratic Party, and currently the Representative for Florida’s 13th congressional district. He was a Republican from 1974 until 2010. His career started in the early ‘80s. Have you ever wondered how rich Charlie Crist is, as of mid- 2017? 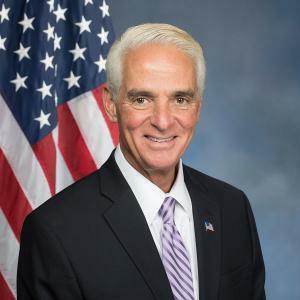 According to authoritative sources, it has been estimated that Crist’s net worth is as high as $2 million, an amount earned through his successful career as a politician, in addition to which he has also worked as a lawyer, which improved his wealth too. Charlie is the only son of four children born to Charles Joseph Crist, Sr. who worked as a physician, and his wife Nancy. Charlie is of mixed ancestry; his father is of Greek Cypriot and Lebanese ancestry, while his mother has Scots-Irish, Swiss and Welsh blood. While he was still a child, Crist’s family moved to St. Petersburg, Florida, where he attended St. Petersburg High School. After matriculation, he enrolled at Wake Forest University, but after two years transferred to Florida State University, from which he received his undergraduate degree. While at Florida State University, he served as Vice President of the student body, and was a part of the Pi Kappa Alpha fraternity. After Florida State University, Charlie enrolled at Samford University, Cumberland School of Law, from which he received his Juris Doctor degree in 1981. Following his graduation, Charlie focused on passing the bar exam, however, he needed three attempts to finally pass it. His first job was as general counsel to Minor League Baseball, with headquarters in St. Petersburg. However, Charlie became fond of politics, and joined the Republican Party, and from 1986 started building his name as a politician. He first ran for a state Senate seat in Pnellas County, however, he lost in a runnoff. Two years later he was one of the integral parts in running the successful campaign of Connie Mack III for the United States Senate. Then in 1992 he assumed a spot in the Florda Senate for the 20th District, and served in that position until 1998, defeating Henel Gordon Davis of Trampa in the first elections, and then Dana Lynn Maley for the second term. Both were members of the Democratic Party. However, in 1998 he lost the election to Bob Graham, but in 2000 found a new place in politics, as Education Commissioner of Florida, and held the position for the next three years, which increased his net worth somewhat. In 2003 he was appointed as Florida Attorney General, and served until 2007 before being elected Governor in 2006, which position he held until 2010, deciding not to run again for Governor, but instead tried once again to gain a place in the US Senate. During his tenure as Governor of Florida, he was focused on improving education and the environment, and put all efforts on making Florida clear from criminals by instituting capital punishment. In 2010 he started a campaign for the US Senate, however, once again he was unsuccessful. Two years later, he joined the Democratic Party and supported Barack’s Obama presidential campaign. He stated that he was dissatisfied with Republican politics affecting woman, immigrants, seniors and students. In 2016 he ran for Florida’s 13th congressional district, and defeated David Jolly with 52% of the votes. He was sworn in on the 3rd January 2017, and became the first Democrat with this seat since 1955. Regarding his personal life, Charlie has been married to Carole Rome since 2008. Previously, he was married to Amanda Morrow, but that marriage lasted only a year, from 1979 until 1980. Parents Nancy Lee, Charles Joseph Crist, Sr.
1 Lost the race for the U.S. Senate seat from Floria on November 2, 2010 to Marco Rubio. 2 Former Attorney General of Florida (2003-2007). 3 Governor of the State of Florida (USA) since January 2, 2008.